1. 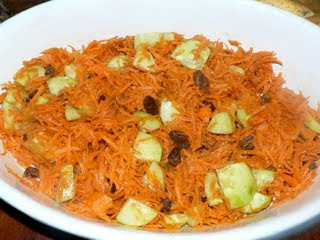 Mix the grated carrots, cucumber and raisins in a bowl. 2. For preparing the dressing, in a separate small bowl, mix together lemon juice, ginger powder, cinnamon, honey, olive oil and pepper. 3. Now add this dressing into the carrots mixture and mix well. 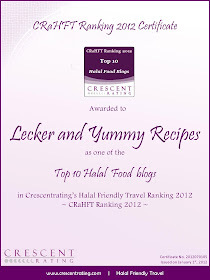 Serve with rice or breads. Tip : The raisins look good when you soak them in water for 10 minutes before adding into the carrots. 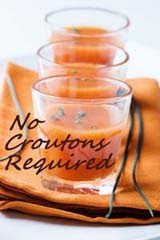 This recipe goes to the event "Healing Foods - Carrots" hosted by Suma of Veggieplatter, which was started by Siri. Thank you both ! This recipe also goes to the event Vegetable Marathon started by Shilpa and hosted this month with carrots as the theme by PJ. Thank you PJ and Shilpa ! Very nice salad Reshmi, looks lovely. I love these kind of salads.Fast to put together and healthytoo.. Healthy salad ..very nice Reshmi. Love this variation of Carrot salad. super and yummy looking salad. very healthy too.